Is a Pre-employment Credit Check Hurting Your Work-at-Home Prospects? Pre-employment Credit Checks & Working at Home: Is Your History Hurting You? Published July 22, 2018 Disclosure: We may receive compensation if you sign up for or purchase products linked to below. We try our best to provide the most accurate information, but details do change. Please refer to the company website for the most up-to-date information on any lead or recommendation. Do the words “credit check” make your stomach drop? You’re not alone! Many of us have wound up with a bit too much debt from time to time, especially when we’re trying to raise families or bounce back from the Great Recession. There might even be a blemish or two that we’re still working diligently to wipe off our credit report – so the idea of having a prospective employer check our credit can make us downright nervous. Especially when we’re trying to prove we’re reliable enough to work at home. Listen up, and I’ll let you in on a little secret about work-from-home job prospects and your credit history – and explain how worrying over your report won’t do anyone any good. I’ll show you what actions to take instead. Is My Credit History a Problem? Let’s break down the role of credit in the hiring process, and how you can better understand and control your credit report. You may be wondering why the heck these companies need to know anything about your credit, anyway – you’re trying to earn money by working for them, you’re not asking for a loan. And that’s a great point. Sometimes the answer is innocuous – they’re using it as part of the background check process to make sure you are who you say you are and not a fabulously wealthy cat burglar laying low for a while under a fake identity. Other times, the answer is more serious – if you’re being considered for a position that deals with money (whether it’s the company’s money or a client’s) or sensitive information, the hiring team may require reassurance that you’re not in dire financial straits that may compromise your integrity. You read that right: some companies may be trying to figure out if you’re likely to steal from them. They want to make sure that you pay your bills on time and don’t have a history of dubious spending or repayment problems. If you’re responsible with your money, surely you’ll be responsible with theirs, as well. A few of the work-at-home jobs for which we commonly see credit checks run include customer service and sales positions, accounting and bookkeeping jobs and those within the financial sector. Those jobs that often don't involve a credit check include teaching English online, freelance writing, search engine evaluation and many small cash opportunities. Here’s some good news: as of 2012, a survey published by the Society for Human Resource Management revealed that 80% of those companies who performed background checks on their prospective hires – and ended up hiring the person in question – did so in spite of there being some negative information on their credit reports. So if your credit history’s not great, that’s not the end of your hopeful remote career. You may even have a chance to explain any negative history during an interview, and extenuating circumstances such as spousal job loss or serious illness could be leveraged during that discussion. Just be careful – make sure to emphasize that your circumstances have changed if you can and that you’re committed to improving your credit report. You don’t want them to think you’re a bad bet. If you’re still worried about a credit check being run on you, remember that you must give them permission to pull your credit report. However, withholding permission will likely disqualify you from consideration by giving the impression you have something to hide. Rest assured that, if they decide not to hire you based on something in your credit report, they are legally obligated to tell you about it in advance and then provide you with a copy of the credit report afterward. Prefer to check out some work-from-home jobs that don’t require a background and/or credit check? I’ve got a list of those for you right here. Understanding your credit report and score and being completely informed on your credit history are the best ways to protect yourself from any nasty surprises. You can ensure that anyone who runs a credit check on you has an accurate picture of your credit and rest easy that you’re prepared should anyone – say, a hiring manager – question you on a less-than-stellar credit report. First, take advantage of your free annual credit report. Every twelve months, you are entitled to a free credit report from Equifax, Experian, and Transunion, the three major credit bureaus. By getting your free reports every year, you can carefully review them in full to make sure there are no mistakes or suspicious activity. It’s a great first step in maintaining good credit habits and discovering any signs of identity theft. If you notice any strange items on your credit report, make sure you follow up. Reach out to the credit account that reported the incorrect information and have them correct their accounts. Once they do so, make sure they report the change to all three credit bureaus so that the items are also removed from your credit report. So that you can rest easy that your credit report continues to remain accurate, I recommend that you sign up for a free credit score monitoring and credit report analysis tool like Credit Sesame. They’re a great choice for a complete look at your finances and credit: they monitor for credit changes, refresh your credit score each month, and will even send you daily monitoring alerts when they discover any changes to your report. They also throw in free identity theft insurance protection (up to $50,000). They round out their value by offering analyses of your credit card use, outstanding loans and payment history, while also offering you great deals on new lines of credit (whether for a card, or house or auto loan) that best suit your financial circumstances. 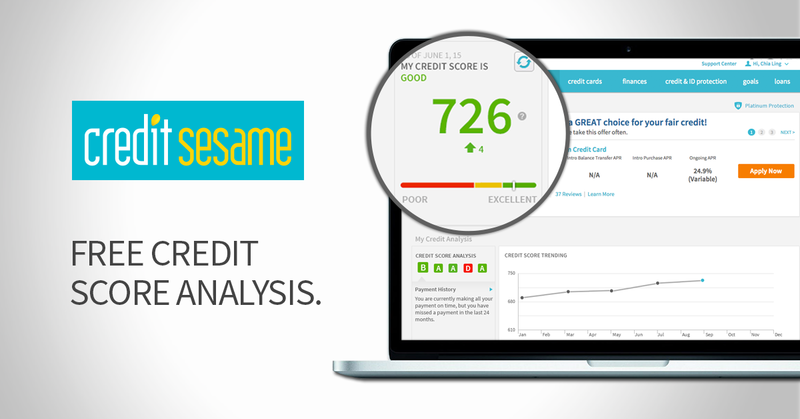 With their accompanying app, Credit Sesame’s just an incredibly useful tool. Ultimately, if your credit report is a serious concern in relation to your work prospects, the only thing you can do is work through it. Two simple ways to start improving your credit report are by making regular payments on any credit card bills and outstanding loans and making sure you don’t max out your credit cards. Having credit available but not in use is good for your credit evaluation, and a reliable payment history makes the credit bureaus more confident in you, too. Of course, simple doesn’t mean easy – when things are tight, making those payments can be one of the hardest things to do. But if you can find a way to hold that line, you’ll find your prospects improve overall and notice you have a little more breathing room. I hope I’ve inspired you to take control of your credit report and also go for that remote job you really want – even if you are nervous about a credit check. Just remember to keep calm, work through it, and you’ll be building your work-from-home career in no time.